Applications for the Educate and Grow Scholarship Program at Northeast State Community College are being accepted now for all high school seniors graduating this spring and residing in Carter, Johnson, Sullivan, Unicoi, and Washington counties and the city of Kingsport. Eligible students can download applications online at www.educateandgrow.com. Scholarship award amounts depend on the number of student applicants in Educate and Grow and the availability of funds. The priority deadline to submit an application is March 31. An Educate and Grow Scholarship applicant must be a member of a 2013 high school graduating class and have a custodial parent or court-appointed legal guardian who meets program residency requirements and has lived in their county of residence for 12 months prior to the applicant’s high school graduation date. An applicant must enroll at Northeast State as a degree-seeking student for the upcoming fall 2013 semester and meet all scholarship requirements. Educate and Grow provides tuition assistance for qualifying students graduating from high schools located within the College’s service area. The program was initiated in 2001 between Northeast State and the governments of Kingsport and Sullivan County. 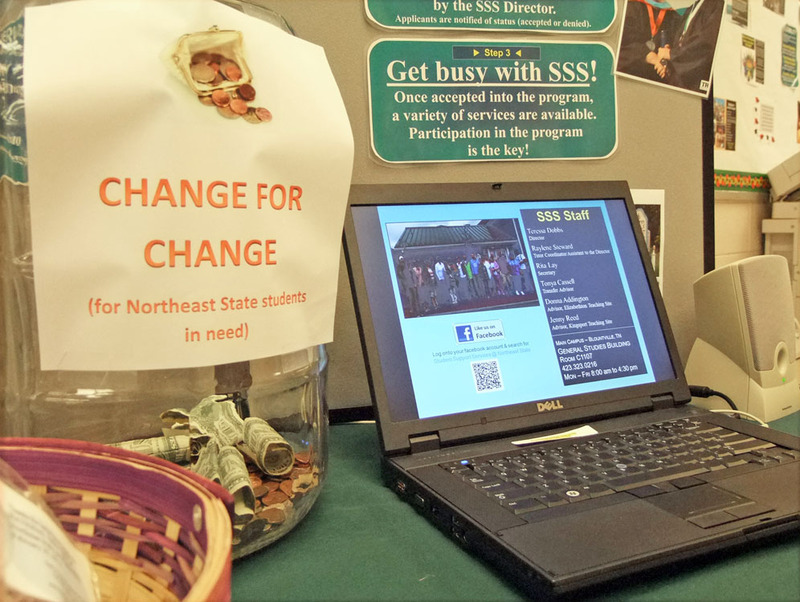 Northeast State has since partnered with other local governments, private companies, and individual donors to expand the program throughout the College’s five-county service area. 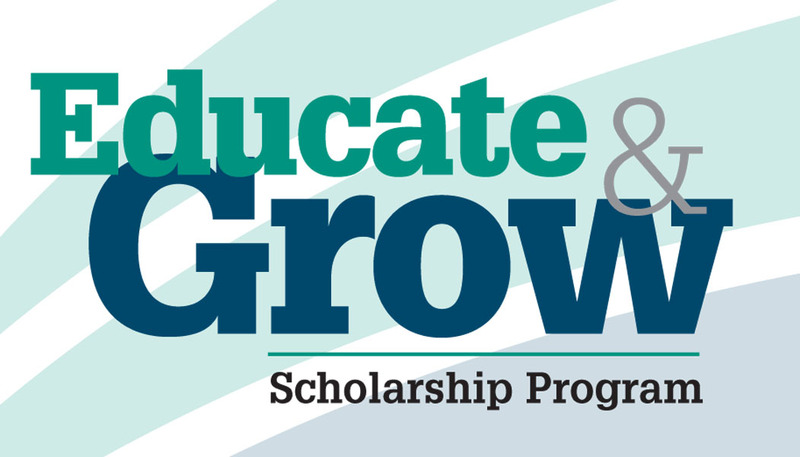 Applications for the Educate and Grow Scholarship Program are available at the student guidance offices of local high schools. Applications can also be picked up at the Northeast State campus in Blountville or teaching sites at Elizabethton, Gray, Kingsport Center for Higher Education, and the Regional Center for Applied Technology in downtown Kingsport. Completed applications must be submitted in person at the main campus Faculty Office Building, office F100, 2425 Highway 75, adjacent to Tri-Cities Regional Airport. For more information or questions contact the Northeast State office for Scholarship Programs at 423.354.5235 or e-mail jajohnson@NortheastState.edu. No Oscar statues were involved, but Northeast State Community College students enjoyed a weekend of winning and recognition for their achievements. 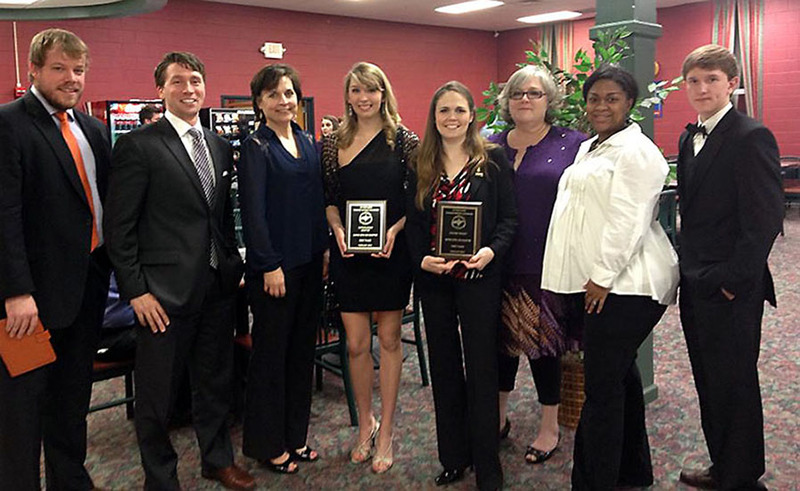 The College’s Alpha Iota Chi chapter of the Phi Theta Kappa International Honor Society won several team and individual honors at the society’s regional convention held this weekend at Motlow State Community College in Tullahoma, Tenn.
Alpha Iota Chi student members and their faculty advisors. The chapter took 1st Place for the Most Distinguished College Project for The President’s Student Leadership Academy. The Academy formed last fall bringing together students nominated for their leadership potential by faculty and staff. Students spent the semester involved in group dynamics and breakout sessions to learn more about themselves and each other. Alpha Iota Chi also earned the coveted Five-Star Chapter status, the highest status level awarded to any chapter. Alpha Iota Chi was also named a Chapter of Light, which means the Chapter went above and beyond the expectations of the organization in fulfilling the Phi Theta Kappa hallmarks of Scholarship, Leadership, Service, and Fellowship. Elizabeth Ross and James Wagner display their awards. The chapter also received the 2nd Place award for the Most Distinguished Honors in Action Project for the Project Vote campaign. Project Vote sought to register new voters for the 2012 primary and general election. As a part of Project Vote, local candidates for state office participated in a candidate forum to educate the campus and surrounding community about their positions on relevant issues. Honeycutt said the chapter’s excellent year can be attributed to student leadership provided by Anne Rowell, chapter president; Ross, vice-president of Scholarship; Hope Nunn, vice-president of Leadership; Wagner, vice-president of Communications; Sharon Woods, secretary; Heather Blair, treasurer; and Amanda Broome, vice-president of Fellowship. The PTK Region’s Most Distinguished Faculty Advisor award winner Jane Honeycutt. 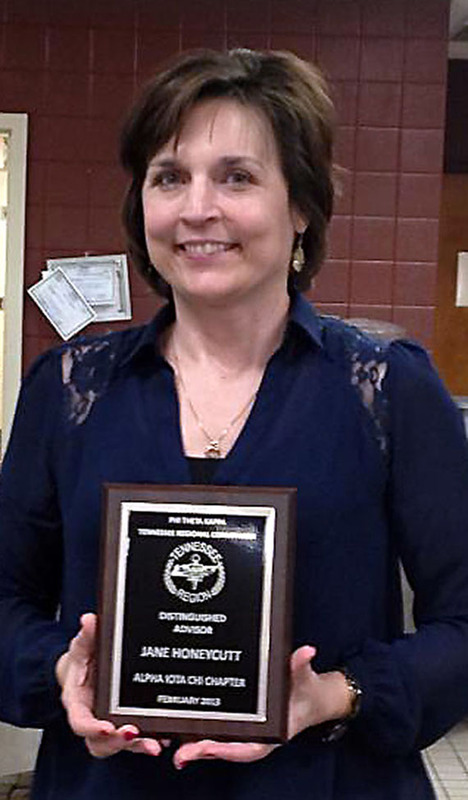 The chapter’s success extended beyond students – Honeycutt won 1st Place as Most Distinguished Faculty Advisor. As chapter advisor and director of the Northeast State Honors Program, Honeycutt works with Alpha Iota Chi members and Honors Program students on a variety of projects throughout the academic year. Alpha Iota Chi and Honors Program student members have been consistently recognized for their achievements under Honeycutt’s guidance. Alpha Iota Chi members engage in research projects each year as part of their independent study. An Alpha Iota Chi member must maintain a minimum grade point average of 3.5 and demonstrate leadership and community service consistent with Phi Theta Kappa principles. 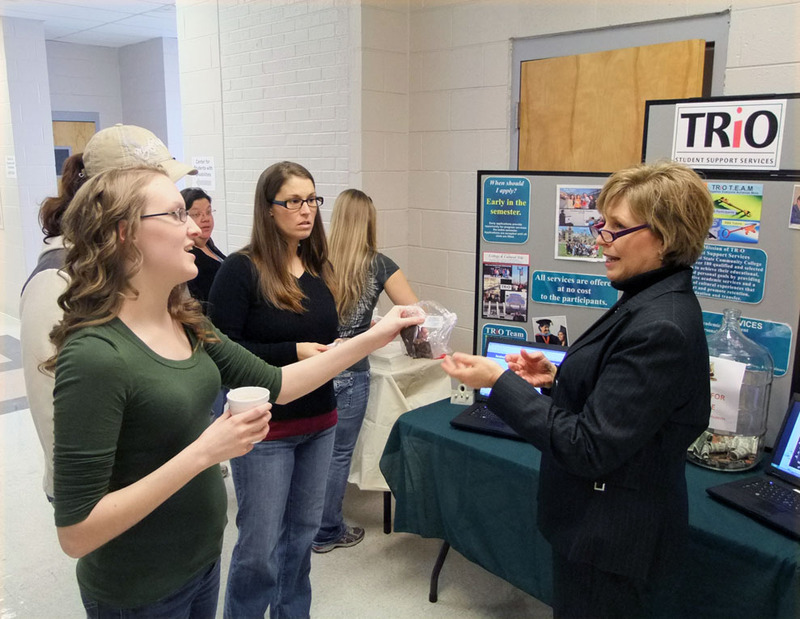 “Phi Theta Kappa offers students a unique opportunity to grow leadership skills and become competitive for generous transfer scholarships to both public and private universities,” said Honeycutt. Memphis, the undisputed home of Blues, Rock & Roll, and Gospel, has long helped the world move to different grooves. It is also the history of the city that channeled the creative fire in the soul of classically trained bass vocalist Jonathan A. Blanchard. Come hear one of music’s most transcendent bass voices when Blanchard visits Northeast State on Feb. 25 at 7 p.m. for one special performance at the Wellmont Regional Center for the Performing Arts on the main campus in Blountville. Admission is free and open to all. Blanchard’s artistic tastes were first forged in grade school. However, by the time he entered high school his artistic curiosity had led him to sing in various choruses and to act in a number of community theatre productions. While achieving the Bachelors of Science in Commercial Music and the Master of Science in Music Education degrees from Tennessee State University, he learned to weave the various elements of his artistic nature into his style of delivery. His stage credits include roles as diverse as “The Priest” in Your Arms Too Short to Box with God, “Bernardo” in A Westside Story, “Simeon” and “Potifer” in Joseph’s Amazing Technicolor Dreamcoat, “Caesar” in Scipio, the “Ex-Slave” in Do Lord Remember Me, “The Lion” in The Wiz. Drawn also to film, he has appeared as an extra in several movies block-busters, done voice-over work for local and national concerns, appeared on Memphis WREG – Live At 9 program. He has been the featured singing artist on the PBS film Underground Railroad – Quilt Code; for Georgia Public Broadcast. In conjunction with Opera Memphis’s Educational Outreach Program—Black Roots in Opera, Blanchard toured throughout Tennessee’s major metropolitan areas to help celebrate the Life & Artistry of Paul Robeson. 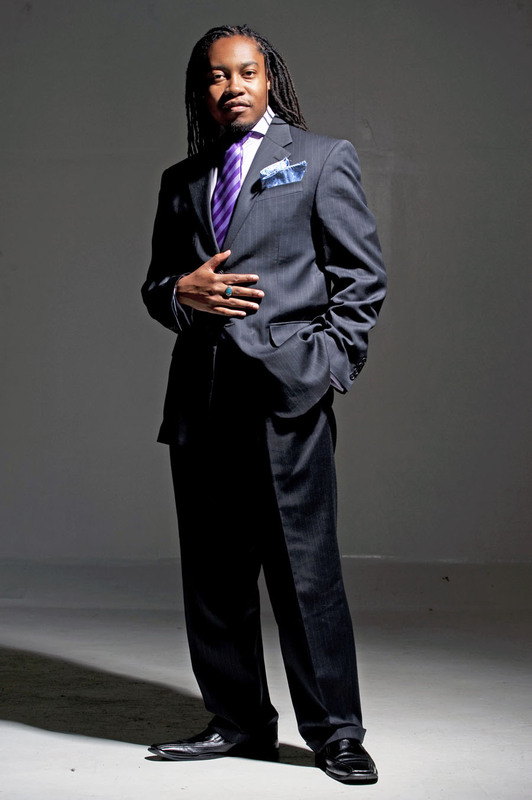 Blanchard’s operatic credits include affiliations with Opera Memphis and AmeriColor Opera Alliance Guild of Atlanta. He was presented with the title role of “Solomon” in the production The Seduction of King Solomon; a work written especially for him by critically acclaimed composer Sharon Willis. Doors open at 6:30 p.m. For more information, contact 423.279.7669 or visit www.jonathanblanchard.com. Students and Staff from TRiO Student Support Services will participate in recognition of National TRiO Day on Wednesday, Feb. 20. As a way to show appreciation to the College for its support TRiO will be serving cookies, brownies and hot chocolate to the college community on the first floor of the General Studies Building and cookies on the first floor of the Kingsport Center for Higher Education. A donation jar will be set up and all proceeds will go towards the Student Needs Project, Change for Change. For millions of students from low-income families who strive to be the first in their families to attend and graduate from college, seven federally funded programs called TRIO are making a world of difference. Enjoy some cocoa and cookies with SSS director Teressa Dobbs at the TRiO Day event. Unlike student financial aid programs which help students overcome financial barriers to higher education, the TRIO programs (Talent Search, Upward Bound, Upward Bound Math/Science, Veterans Upward Bound, Student Support Services, Educational Opportunity Centers, and the Ronald E. McNair Post-Baccalaureate Achievement Program) have been providing valuable supportive services to students from poor and working families to help them successfully enter college and graduate for over 40 years. TRiO Day is also about helping students in need at Northeast State. 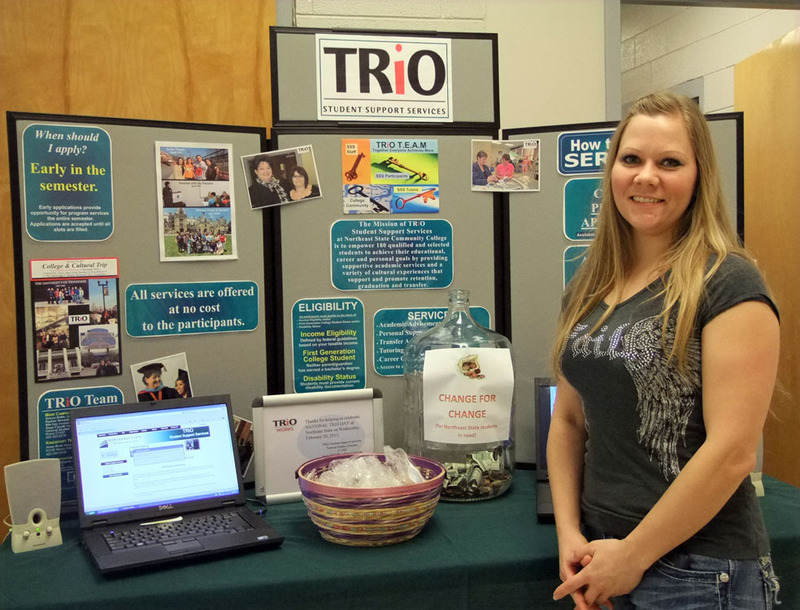 TRiO Student Support Services at Northeast State serves more than 180 students and has been in existence nearly 30 years. Dr. Chris Lefler was the first project director, and TRiO has continued going strong since 1984. By providing services such as assistance in choosing a four-year college, tutoring, personal and financial counseling, career counseling; assistance in applying to college, workplace and college visits, teaching study and time management skills, and assistance in applying for financial aid. According to students who have participated in the TRiO program, TRiO Works! “It has helped me not only build my self-confidence but also taught me that I can. Yes I can!” said one student. “I have learned more scholarships and classes I need to take and also what I need to do to succeed,” stated another. Renee Powell helps coordinate TRiO Day. Today more than 1,200 colleges, universities, and community agencies host more than 2,800 TRIO projects that serve approximately 790,000 young people and adults. Thirty-five percent (35%) of TRIO students are White, 35 percent are African-American, 19 percent are Hispanic, 4 percent are American Indian, 3 percent are Asian-American, and 4 percent are listed as “other,” including multiracial students. Approximately 7,000 TRIO students have disabilities. Whether winning awards or impressing industry professionals, the theater students of Northeast State Community College continue to make their mark at a prestigious theater festival competition. Department director Elizabeth Sloan, technical director Brad McKenzie and 12 theater students traveled to Albany, Ga., last weekend to participate in the Kennedy Center American College Theatre Festival (KCACTF), Region IV. 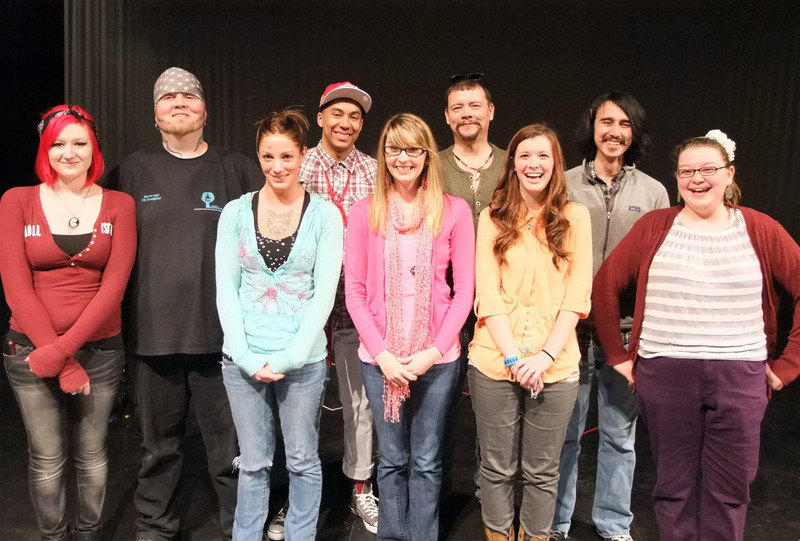 Northeast State students earned 10 nominations for their work in the department’s productions of 2012. KCACTF Region IV student participants (from left) Amanda Haney, Richard Curtis, Amanda Neas, Richard Jackson, Anne Rowell, Bob Dotson, Kara Grindstaff, Will Lambert, and Rachel Lawson. (Not pictured Andrea Sessis, T.J. Laws, and Hannah Duncan. Student Amanda Haney was named the overall Weiss Design Winner for her Costume Design for the play Alice, an adaptation of Alice in Wonderland. The Weiss Design Competition required contestants to create a design for a theoretical production of their choosing. This year, the category encompassed all three sections of lighting, costume, and art design. Amanda Haney won the Weiss Design Award at KCACTF Region IV. Haney’s win marks the second consecutive first-place award win for a Northeast State student in the Weiss competition – Amanda Neas won the Lighting Design Award last year. 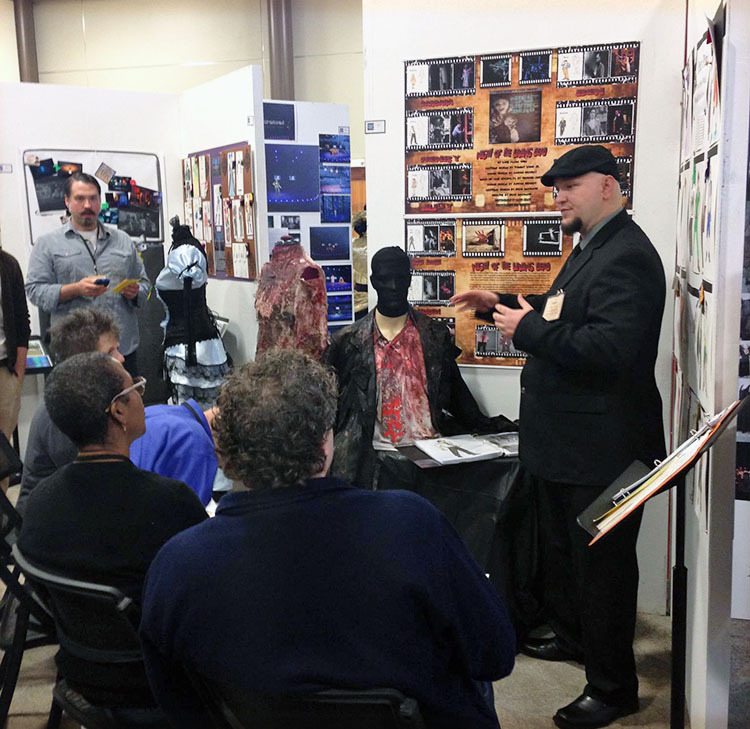 Fellow students T.J. Laws earned Honorable Mention for his Costume Design work on the Night of the Living Dead production last fall while Richard Curtis received an Honorable Mention for his makeup design on Living Dead. Student T. J. 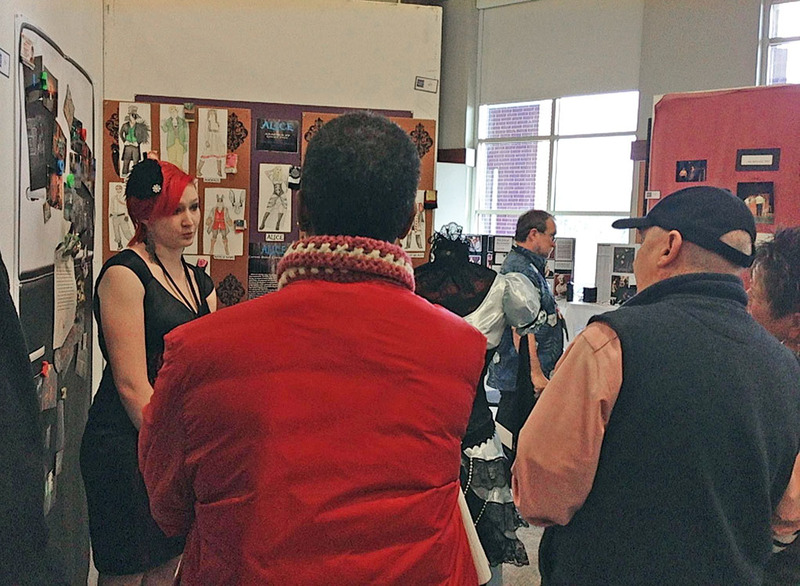 Laws presents his costume designs to the KCACTF judges. Haney, Curtis, and Laws expect to graduate this spring. They have all been admitted to the Theater program at Virginia Intermont College in Bristol. All three will be working on Northeast State Theater’s upcoming spring production of Treasure Island. Student award recipients (from left) T.J. Laws, Richard Curtis, and Amanda Haney. Students Rachel Lawson, Hannah Duncan, Anne Rowell, Bob Dotson, Richard Jackson and Kara Grindstaff participated in the Irene Ryan Acting Competition. Jackson and Rowell were nominated for their roles in Night of the Living Dead. Lawson received a nomination for her performance in Godspell. Dotson, Duncan, and Grindstaff served as the trio’s acting partners to the nominees’ scenes for the judges. Sloan also praised actor Shelby McKenzie for preparing the actors. Neas and Northeast State alumnae Andrea Sessis were a part of the festival’s Stage Management fellowship competition. Sessis stage-managed and did costume design for the spring production of Godspell while Neas wrangled zombies and survivors in Living Dead. 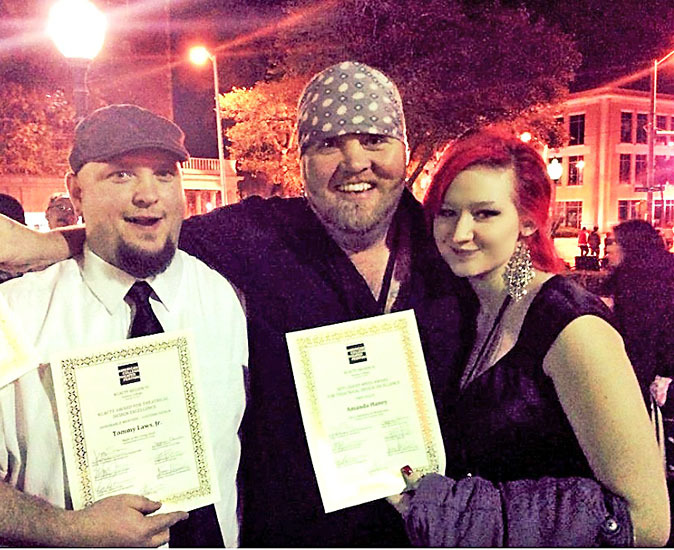 Both students volunteered their time working at the festival’s judging competitions. 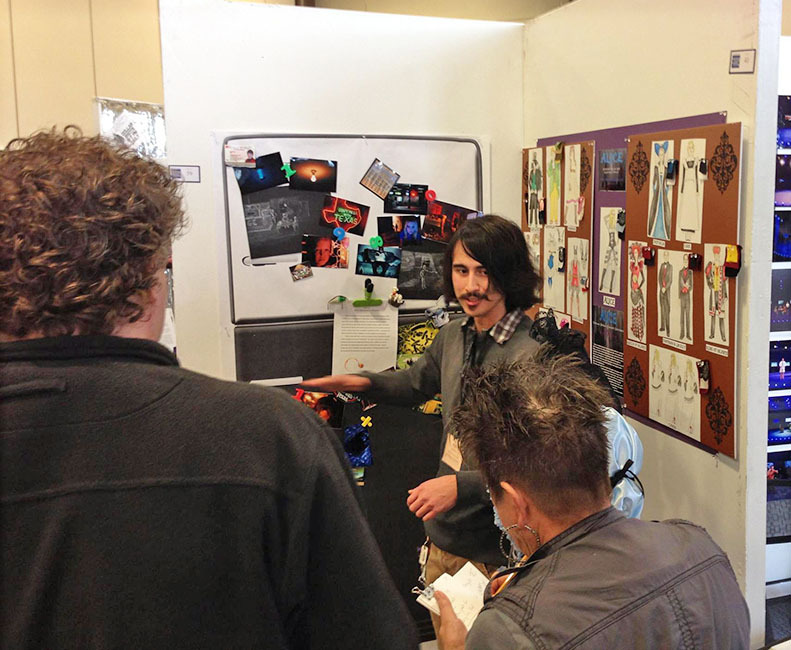 Will Lambert engages with judges on his Lighting Design for NOTLD. Will Lambert entered his work in the competition for his Lighting Design work on Living Dead. Although he didn’t win the category, he did win the praise of a Tony Award-winning Broadway set designer who saw his work. Sloan said Northeast State students attended nine different design or acting workshops meeting with theater professionals, stage-managed entire days of the festival, met several theater professionals, and were recruited by four-year colleges into their theater programs. 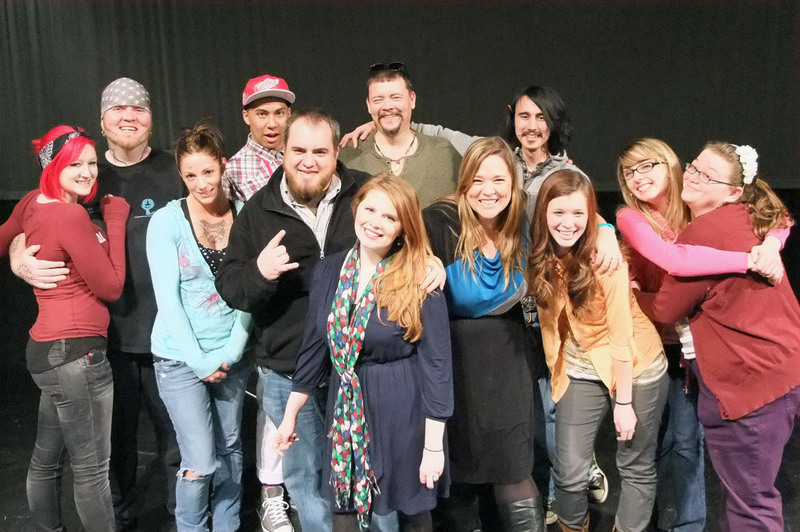 Theater students and faculty members (front row, fifth from left) Brad McKenzie, Shelby McKenzie, and Elizabeth Sloan enjoy what they do. 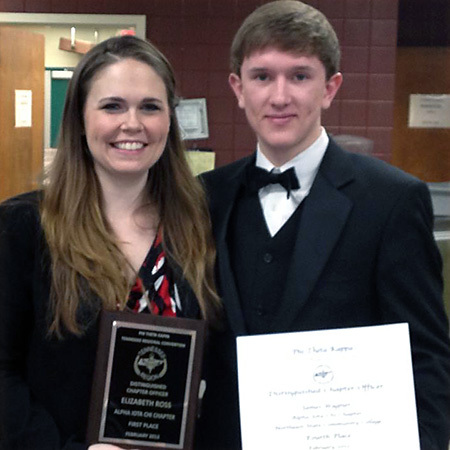 She and McKenzie praised students for the hard work and recognition they received during the festival. Sloan noted the students were competing against graduate students from much large four-year institutions around the region.